I wrote earlier of three clocks. Here is the Seth Thomas/E. Ingrahm? I did some research and found others but I did not find any history on the clock. Any information would be appreciated. 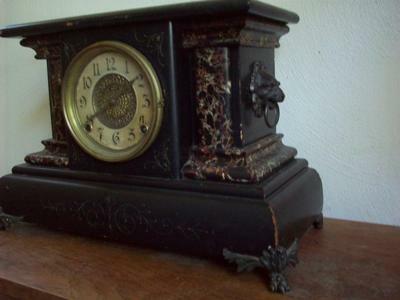 As with the others, I want to insure or sell this clock. Thank you all. Thank you for the information. There is a painted over label on the back but,it isn't very legible. I appreciate your input on the circa and manufacturer. The clock is still working! I can now begin to look into the insurable value.